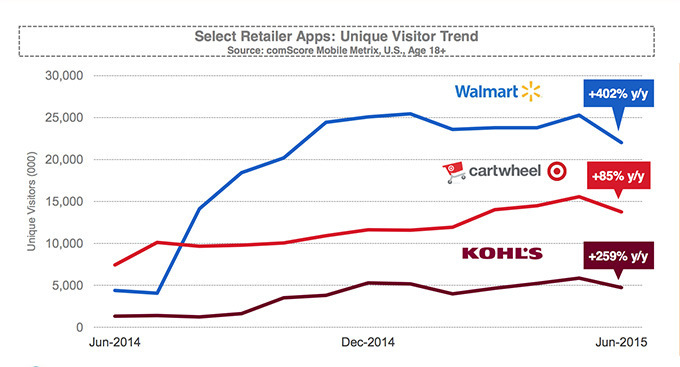 Retailers like Walmart, Kohls, and Macys are making huge investments in the mobile shopping experience for their consumers. And data from comScore's latest mobile report shows those investments are starting to pay off. According to Digiday, "Walmart cracked the top 25 of all U.S. mobile Web properties, and app visitors rose 400 percent year-over-year to more than 20 million people. Target and Kohl’s showed similar strength." According to comScore, much of this new traffic is driven by retailers' leveraging in-store coupons and savings features to propel usage from shoppers, while they're on the go and while they're in the store. This focus of the major retailers makes it clear that rich product content is the next frontier to drive online shopper interactions. Walmart's Content Spec 2.0 initiative is the primary example of retailers driving suppliers to provide the rich product content that drives online discoverability and sales. Google is launching the Google Manufacturer Center and their buy button is another example of the trend of commitment to content as the game-changer. Macy's recently asked suppliers to provide additional attributes to meet the new GS1 Guidelines, to which they were a major contributor. Kroger launched Program Mercury to drive products to consumers faster and give them the detailed dietary and allergy information they need to make the right buying decision. The trend is clear and irreversible: consumers are hungry for rich product content and now brands and retailers need to deliver the content that will get them to stay and buy. The conclusion here for brands and retailers: don't wait to be pushed - focus on detailed product content. Shoppers are engaging online more than ever before, and what drives their behavior won't just be coupons. It will be content.